Everything seems to be going the Royals' way once again in October, but it isn't just good fortune; it's also the result of Kansas City's coaching and the team's style of play. KANSAS CITY—Toronto pitcher David Price had thrown 236 1/3 innings this year without allowing a stolen base, the most since Luis Tiant way back in 1968. So naturally, with the Royals on this magic carpet ride of a two-year run, when Eric Hosmer—who had all of seven steals this season—reached first base with Kansas City losing to Price 3-1 in ALCS Game 2 Saturday and down to their last nine outs, there was only one thing for first-base coach Rusty Kuntz to tell Hosmer. Some very cosmic things are happening in Kansas City. Ned Yost has turned into the second coming of Hall of Fame manager Joe McCarthy, and then some. Alcides Escobar has become the kind of anti-leadoff hitter that fries the motherboards of every sabermetrician. An American League team with its corner outfielders batting eighth and ninth is outscoring the greatest offensive team in baseball. And Kauffman Stadium must be haunted, because the Blue Jays’ second baseman was hearing voices. But that one moment—Kuntz telling his first baseman to go for the first stolen base with Price on the mound since Sept. 28, 2014—tells you all you need to know about the days of the supernatural at the K. Of course, such lunacy worked out perfectly. Chances? Philippe Petit took fewer chances. Wasn’t Hosmer surprised to hear Kuntz tell him to run? Much will be written about the pop-out that wasn’t to start the inning. What should have been the 19th consecutive batter retired by Price became a leadoff hit for Ben Zobrist when Toronto second baseman Ryan Goins, thinking he heard someone say “I got it,” backed away from the ball in shallow rightfield just when he was about to catch it. (More weirdness, this under the heading of the Zen of Ben: Zobrist lays his bat down gently when he hits the ball hard—“Good boy”—and slams it to the ground when he doesn’t—“Bad boy.” This was bat-slam kind of contact.) This was the break the opportunistic Royals needed. Still, Price had just a runner at first base with a 3-0 lead, he'd been displaying the kind of stuff that made him in Hosmer’s book “as good as I’ve ever seen him,” and there were three lefthanded hitters due up among the next six batters. Does that sound like it would make sense that 31 pitches later the Royals would be leading 5-3? Does that sound like it would make sense that Kansas City would now be up 2-games-to-0 in the American League Championship Series? But of course, all that happened. Kansas City is a royal pain to any club that dares get in its way, and especially to those that dare take a lead. Lorenzo Cain followed Zobrist’s parachute single with a clean single of his own. Hosmer, who had fanned twice against Price, suddenly solved the Toronto ace by lining a changeup for a single into left-center for an RBI. After Kendrys Morales swung through the next pitch, Kuntz thought the perfect time to run on Price had arrived. As Hosmer took off, Morales hit what would have been a routine groundball double play. Instead, shortstop Troy Tulowitzki could get only one out, at first base. A run scored to make it 3-2. 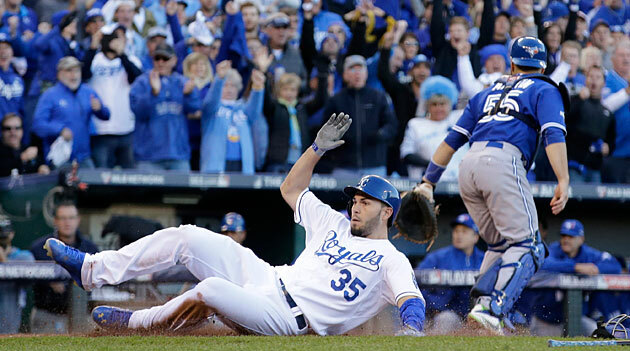 The Royals' unlikely decision to have Eric Hosmer try and steal second later paid off when he scored the tying run in the midst of their game-winning rally. The next hitter, Moustakes, laced a single to right. Hosmer scored the tying run. Price struck out Salvador Perez, and when he forged a 2-and-2 count against Alex Gordon, the lefthander was one out away from sending a tie game to the eighth. Price tried four times to finish off Gordon, a lefthanded hitter, and failed each time. A foul ball, a ball on a changeup over the plate that Gordon somehow took like he knew it was coming, a foul ball on a good fastball away, and then a run-scoring double into right-center on a fastball that got too much of the plate. The Royals added two more runs to salt away the win, 6-3. Their lefthanded hitters—Hosmer, Moustakas and Gordon—had been 0-for-6 against Price in the game and 6-for-38 (.158) in their careers against him until the seventh inning, when the pixie dust started flying. The three of them would get five plate appearances against Price and Toronto’s only lefty reliever, Aaron Loup, in the seventh and eighth innings. They would win every one of them, going 4-for-4 with a walk and three RBIs. The reality is that such bizarre happenings are occurring so often for Kansas City that they cannot be considered flukes. The Royals are the model postseason team. They are the toughest club in baseball to strike out, they are one of the best baserunning teams, they have a surehanded defense—they've made zero errors this year's playoffs and just one in their past 17 postseason games—and their bullpen is ferociously good. Their Yoda in the dugout, Yost, is now 16-6 in postseason games, vaulting him past McCarthy, who won eight pennants and seven World Series titles with the Yankees and another pennant with the Cubs, for the best winning percentage of any manager who ran at least 20 such games. Escobar, his hack-tastic leadoff man with the .293 on-base percentage, is his rabbit’s foot. For some reason numbers can’t explain, the Royals are 87-51 when Escobar works his feng shui atop the order and 13-18 when Yost tries someone different. It may all seem very strange, but Kansas City has built a deep, balanced team that fits its park extremely well. It’s what wins in the postseason. Yes, the Royals received a break here and there. What team doesn’t? The Blue Jays, for instance, were forgiven an out when a foul pop behind the plate by Josh Donaldson that was caught barehanded by Perez clipped a guide wire attached to the backstop. Donaldson followed with a single that led to a two-run inning and a 3-0 lead. Such charity is forgotten, however, because Toronto didn’t do enough otherwise. But Kansas City creates more opportunities than it is given. After their epic ALDS Game 4 comeback against Houston in which they rallied from four runs down with just six outs left in their season, the Royals gave an encore performance in ALCS Game 2. It is by design that they are October’s darlings.